Hot, dry climates cultivate golden fruits and award winning wines below tawny hills, where fine-wool Merino sheep graze. Wildflowers line roadsides, and powerful rivers cut awesome gorges to a lake, and its expanding town. Cromwell was originally located at a junction of the Clutha and Kawarau Rivers. Lake Dunstan was formed in 1993 when the Clyde Dam was completed, flooding part of the original town centre. Many pioneer buildings were rescued and relocated to an historic precinct in Cromwell's current location, on the lake shore. Jackson's Lookout views the waters over the original town. The reconstructed buildings (including stables) of Old Cromwell Town are today alive with artists at work. Glimpse past Central Otago gold mining at Carrick and Bendigo goldfields, and in nearby Bannockburn, an historic town, where sluicing has left its mark. Goldfields Mining Centre has an operational sluice gun, and opportunities to pan for gold. Tour the orchards and vineyards. Abundant sun-ripened apricots, nectarines, cherries, apples and peaches have earned Cromwell its reputation as the 'fruit bowl of the south', while 60 percent of Central Otago's famed vineyards lie across this region. Experience nature at the Bendigo Wetlands, and Chafer Beetle Reserve. Walk Cromwell's unique greenway of tracks. 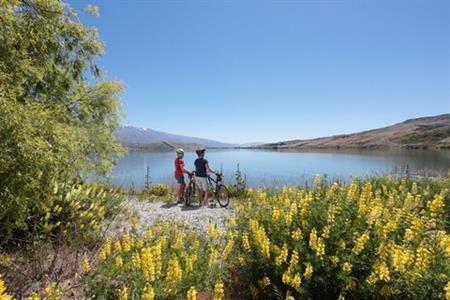 Trout fish (Lowburn Inlet), picnic or jet boat on Lake Dunstan. For some adrenalin and family fun head to Highlands Motorsport Park to explore their motorsport museum, go-karting, mini-golf, dinosaur park or take a lap in the famous Highlands Taxi.